Firewatch has been igniting its fair share of conversation among players and game critics alike. I've seen people discuss the “emotional impact” this game has had on them. Combined with how closely guarded the developers at Campo Santo were about its story and themes prior to release, I was intrigued. Now that I've finished my playthrough, I honestly can't say that I completely agree with my peers who have nothing but adoration for it. While I did enjoy my time with the game, I have a big problem with it. This leaves me with a level of unease that has little to do with Firewatch itself and more the reception of games like it. When people talk about these kinds of story-driven games, I rarely hear any form of praise besides something along the lines of “It made me feel”, “I was moved”, or something else that suggests that it invoked sadness or melancholy on the part of the individual. Rarely are any other forms of praise given on top of that. I fear that this suggests that when we see “walking simulators” (for lack of a better term), that we, as their audience, have this as our default reaction. I say this not to disparage the genre, but rather to show that perhaps we ought to expect more from them. They can be more than just a genre of games where players wander around an environment and get told a story. 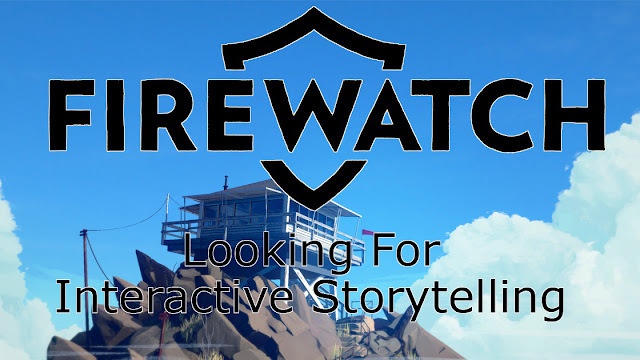 To do this, I'd like to compare Firewatch with a game, in the same genre, that more strongly leveraged the power of the medium to tell it's tale: Gone Home. When exploring the house of Gone Home, players are given clues as to the lives of the people occupying it. While there are notes and messages scattered about the house, there are other ways that it tells players about its cast of characters. Even if I missed the letter to the father of the house from his publisher, discussing how terrible the sales of his book were: I can still understand that he is a struggling, aspiring author by the fact that are boxes and boxes full of his crappy books in his room. Should I have blindly walked passed the diary entries that tell of two friends listening to rock music and playing old games: I can still glean a portion of this by looking into her room and seeing the CDs, radio, game console, and controllers are setup to convey this idea. I am certainly being told the story by the various texts being stored throughout the house. However, there's more to it than that. The props in the space I occupy also, more effectively, chronicle the tales of the people who live in it, and are a part of it. I don't get this same feeling playing Firewatch. Instead of using context clues to discover what is happening in the lives of the game's cast, I am moving my chosen actor around a game board so that he may explain to me what's going on. When I walk protagonist Henry up to a camp, he immediately explains the significance of the props there before I have a chance to think about them for myself. I don't need to figure out what kind of creature shredded the tent of two missing girls in the woods, because Henry has already come up with the idea that they may have been mauled by a bear. I don't need to think about where the bedsheets found at the scene came from, because Henry is quick to remark that they were the same sheets stolen from his watchtower the night before. I don't need to think, because the game is eager to give me an explanation before I even have a chance to explore the scene myself. I'm not the one poking around, seeing what the evidence left behind says. The only thing I am to do is bring Henry to his next destination so that he can tell me what he thinks about the objects and props therein. The world itself also doesn't help to assuage this notion that the player is just Henry's driver. Between set-pieces, players will often end up doing a lot of walking, using a map and compass as their guide. Aside from the scant few supply caches, the area is surprisingly vacant. There isn't even only a few woodland creatures in sight. It's hard to hold this against the game, since the isolation inherent to being a Fire Watchman is part of the point. Yet, this does mean that there are long periods, sometimes of 10 or more minutes (more if the player somehow gets lost or doesn't know where to go) where nothing is happening. Since my playthrough took only about 4 hours, that means that a significant portion of time is spent just walking without even a little interaction with the world. With a few good lines and a nice use of props, Firewatch could use some of this downtime to better sell the protagonist's slowly developing cabin fever, bettering their time economy. Again, I go to Gone Home as an example of the importance of compactness of level design. That entire game takes place in one single location: A house in the suburbs. Even though the house is a larger than the average home, it's still not a big space when compared to the kinds of video game levels most players are used to. But despite it's diminutive size, there are a lot of stories to learn about in this suburban home. This is because the area is compact, limiting the amount of downtime that players experience. Lacking downtime, the chances of players suffering boredom are reduced, keeping them more engaged in the events unfolding. I'm not at all trying to suggest that Firewatch is a bad game, or a lackluster experience. Despite the problems I've talked about, the writing itself kept me hooked throughout my playthrough, even if it fizzles out towards the end. On top of that, the voice acting and direction are some of the best I've heard in a long time. However, it could be so much stronger of an experience than it already is. It could be more than just a story happening while players move from place to place. I admit, as I write this, I've no idea what the reaction to this article will be. What I do know is that I am not content with being a passive participant, eagerly ferrying my protagonist from one location to the next so that the plot can unfold without my influence. Doubly do I feel this when I've little other form of interaction with the world beyond that. This is not an article suggesting that so-called “walking simulators” don't deserve to be called games. Rather, this is to calmly and constructively encourage them to do slightly more with their layout and world design to better engage players in the kinds of stories they wish to tell with that central mechanic. Strong writing is one thing, but the most important thing about an interactive experience is the interactive element.